Philippine Diary How St. Anthony Came to Sampaloc (Manila) by Friar Jack Wintz O.F.M. St. Anthony is alive and well in the Philippines! With the feast of Anthony of Padua approaching on June 13, it’s a good time to recall my February visits to two Franciscan churches in metro Manila. Both churches honor St. Anthony as their patron saint, and both are popular shrines. As we shall see, St. Anthony, who holds the Christ child in his arms, draws many people to Christ. The St. Anthony Shrine in Sampaloc is featured first, not only because it was built before the second one (Santuario de San Antonio in Forbes Park), but also because the historical roots of the Sampaloc Shrine stretch back to a very old and venerable statue of St. Anthony that once stood inla Iglesia de San Francisco(the Church of St. Francis). This huge church, built of stone in 1739, is directly linked with the very first church built (in 1578) of bamboo and nipa by Spanish Franciscan friars shortly after they arrived in the Philippines. This large stone edifice, like its humble predecessor, stood in Intramuros, the old walled city of Manila. The large church, named after St. Francis, attracted many Catholics because of its very popular St. Anthony devotions and because of Anthony’s highly revered statue there. This massive stone structure, like many others in Intramuros, was totally destroyed by bombings at the end of World War II. In the eyes of some, it seemed miraculous that the statue of St. Anthony survived the bombings of 1945 and was found intact amidst the crumbled ruins of the church. The statue was taken for safe keeping to the Franciscan church in Santa Ana (featured in last month’s E-spirations), but was ultimately transferred to St. Anthony Shrine in Sampaloc. According to Father Cielo Almazon, O.F.M., present rector of the shrine, the old, venerable statue of St. Anthony thus came to be mounted on the wall behind the main altar of the Sampaloc shrine. The first Franciscan Church in Sampaloc was Our Lady of Loreto, dedicated to Our Lady under that title in 1616. The pastor was Father Augustin de Tordecillas, one of the first 15 Franciscan friars to arrive in Manila from Spain. During the next 300 years, the church of Our Lady of Loreto experienced many challenges: destruction by fire (1639) and by earthquake (1880), though it was rebuilt in both instances—only to be abandoned because of the Philippine revolution (1896-98) and legal disputes that followed. Our Franciscan presence in Sampaloc survived at times only through the presence of Third Order Franciscans and their well-known VOT (Third Order) Church, located nearby. Today the Third Order of St. Francis is known as the Secular Franciscan Order (SFO). Near the end of World War II (1945), the Franciscan friary and the VOT Church in Sampaloc, as well as many other buildings in Manila, were totally destroyed by bombings of the U.S. armed forces (to eliminate the hideouts of the Japanese occupiers). As noted earlier, the destruction included the old Church of St. Francis in Intramuros, as well as many others within those same old walls. 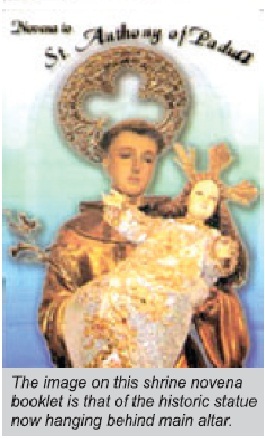 Not long afterwards, Father Mariano Montero, O.F.M., a Spanish friar once stationed at St. Francis Church in Intramuros, came up with the idea of transferring St. Anthony devotions (so popular in Intramuros) to Sampaloc, where the rebuilding of Sampaloc’s destroyed church was about to begin. Father Mariano decided to have the church’s name changed to the Shrine of St. Anthony. Finally, in 1947, the rebuilding of the church was completed and it was rededicated to St. Anthony of Padua.